A recent box shot for the upcoming Wii game FlingSmash reveals that the game, which uses Wii Motion Plus controls, will be packed not with the Wii Motion Plus as originally announced, but with a completely new product: a Wii Remote that includes built-in Motion Plus functionality. Named “Wii Remote Plus,” the controller looks pretty much exactly like a regular Wii Remote. Hopefully this means Nintendo will be phasing out the now-obsolete original remote in favor of a new standard: a base controller truly capable of 1:1 motion controls. 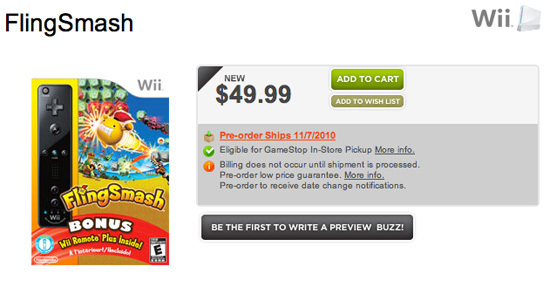 It’s about time the Wii started capitalizing on its full potential. We’ve all been waiting for the day when Motion Plus style controls will be the standard, and this seems to be an aggressive move in that direction. I’ve got my fingers crossed that one of these babies will come bundled with Skyward Sword when it releases next year. Either way, it’s good to see that the hardware is maturing. FlingSmash is an action title in the vein of Boom Blox that is designed with physics that give an arcade pinball feel. It’ll make it to the States on November 7 – and honestly I’m as interested in the game itself as I am in the pack-in.